This feature allows you to specify / override the Tax-type and Tax-rates at the Voucher-level. a. Tally ERP 9 allows you to define / specify the tax rates at different levels viz Ledger level; StockItem level; Company level etc. b. If you are using Sales / Purchase with Inventory, then it is advised that you specify the tax-rates at the StockItem level. c. If you are using Sales / Purchase without Inventory, then the tax-rates must be specified at the ledger level. d. You can override the tax-type; tax-rate; taxable amount at the Voucher level using this feature. A new column has been kept to specify the Voucher class. 1. Error : "Voucher totals do not match"
How to add Freight, Courier, Service charges along with StockItems in Sales Invoice in Tally ERP? 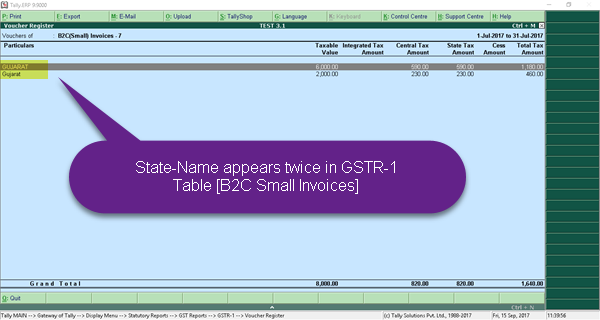 Recently, we noticed that the GSTR-1 report displays duplicate State names in the table B2C (Small) Invoices. Here's a screen snapshot of it. The aforesaid problem occurs when Sales data is imported using udi-Magic Software wherein the State Name is specified in mixed letters. Example: GUJARAT, Gujarat, gujarat. 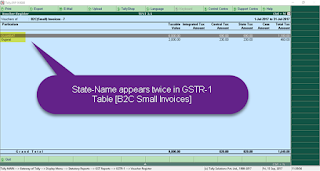 Though it is not yet confirmed by Tally Solutions-Bangalore, this problem prima facie, looks likes a bug in the GST Reports (as Tally ERP is not case sensitive). You can now upload Price levels using the Masters-StockItem sheet itself. However, the Price-levels must exist in Tally and are NOT created automatically. Though these template are discontinued, they are still available within the sub-folder named "templates-discontinued". The template Vouchers-V8-Sales-Purchase.xls contains macros. You must enable macros to hide / show the columns using the EnableDisableFeatures sheet.